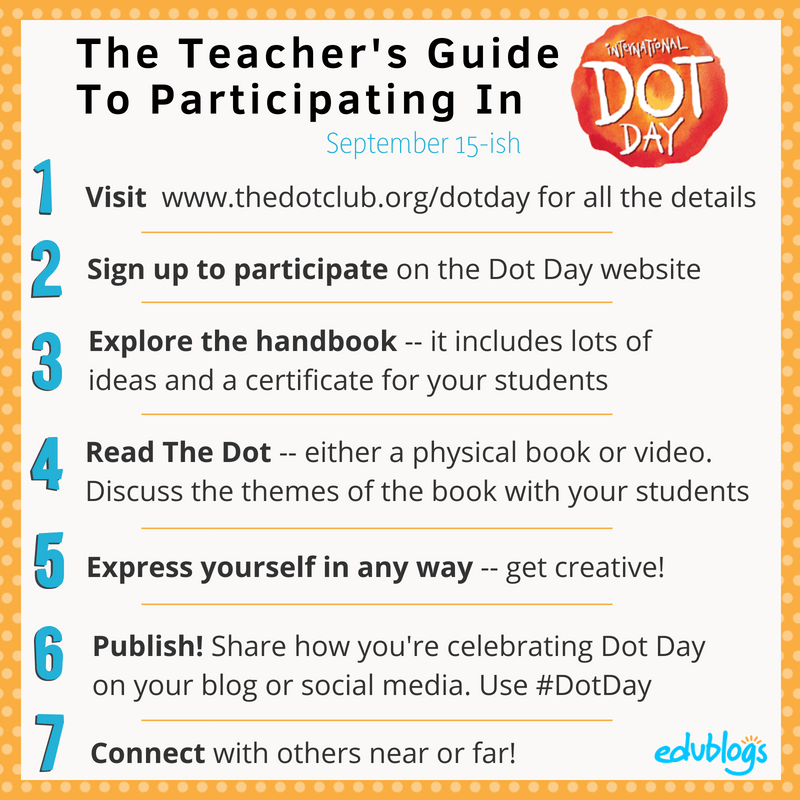 Have you heard about International Dot Day? It’s celebrated every year around September 15th and it’s a great way for your students to celebrate creativity, self-expression, and courage while connecting with others around the world. 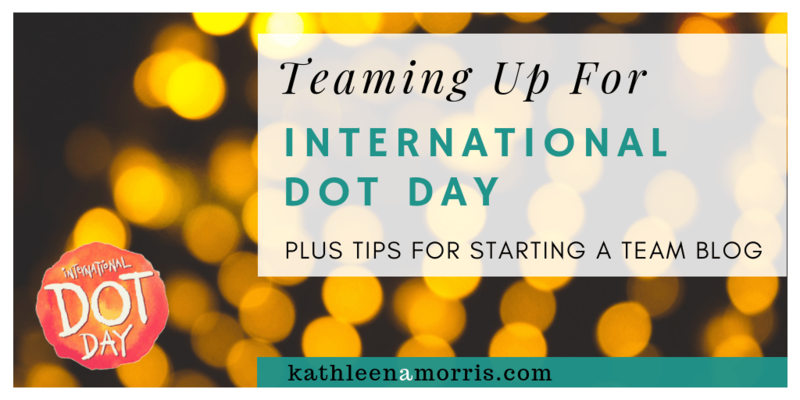 Let me explain what I’m doing to connect for International Dot Day this year. If you’re interested in starting your own team blogging collaborative project, I also share some tips for getting started. Dot Day day started in 2009 when Terry Shay introduced his class to Peter H. Reynold’s book The Dot. This story is about an art teacher who reaches a reluctant student in a creative way. Don’t have the book? You can watch it being read online by Peter H. Reynolds himself. Taking part in International Dot Day is fun, flexible, and free! 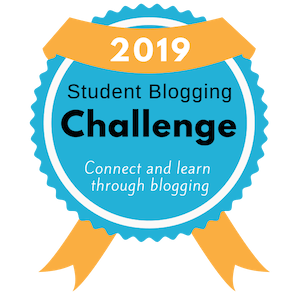 I’ve recently published a post on The Edublogger where I explain exactly how to take part. 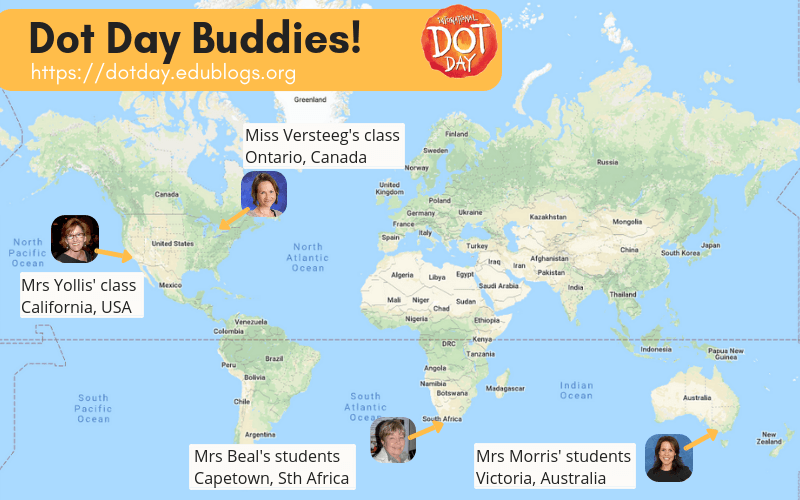 I’ve also shared 7 great examples of how classes celebrated Dot Day in 2017. Any age groups can take part in International Dot Day but it seems to be most popular with classes from K-8. This year I’m working on a mini global project with three other classes around the world. 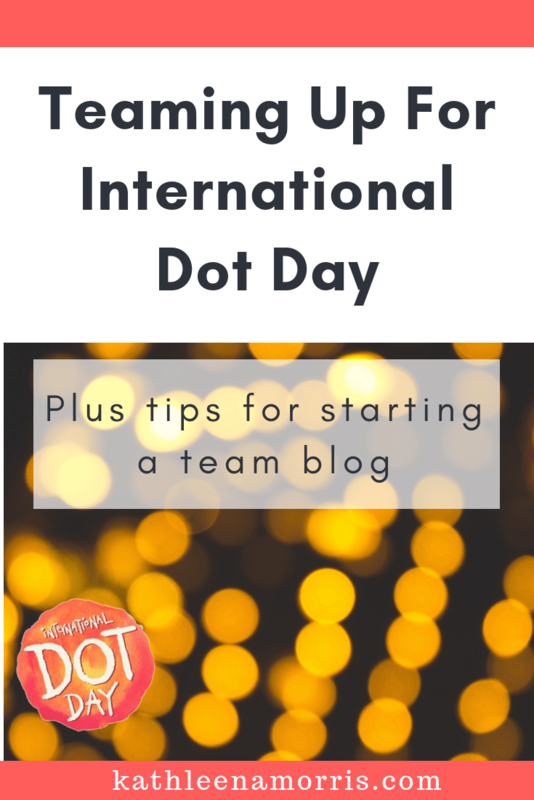 We have made a team blog to connect as we celebrate International Dot Day. So far, the authentic audience and purpose for their work is making this a meaningful and motivating experience for students. The students are also fascinated to learn more about their new friends overseas as they collaborate on the Dot Day activities. I’ve been working with Linda Yollis and her different cohorts of students for around ten years now. I met Becky and Fiona through blogging and Twitter; we haven’t worked on projects before this but no doubt there will be more to come! We only have a limited time frame to work on the project with classes beginning and others ending. We brainstormed a range of different activities which we posted on the blog. Classes are free to complete any activities they like, however, we all thought we’d aim to do Connect The Dot Stories to begin with. Connect The Dot Stories: Students work in teams to come up with a set of around 5 words inspired by the story … and life! Students in another class are challenged to “connect the dots” and come up with a short story using all of the words. Copy Our Dotty Pictures: Students make a picture out of round counters. They post a photo of their creation to the blog and a student in another class tries to replicate it. Augmented Reality Dots: Using the Quiver 3D Coloring app, students bring their own 2D dot creation to life! Dot Day Music: Classes are encouraged to enjoy The Dot Song and consider posting a video with their own rendition. 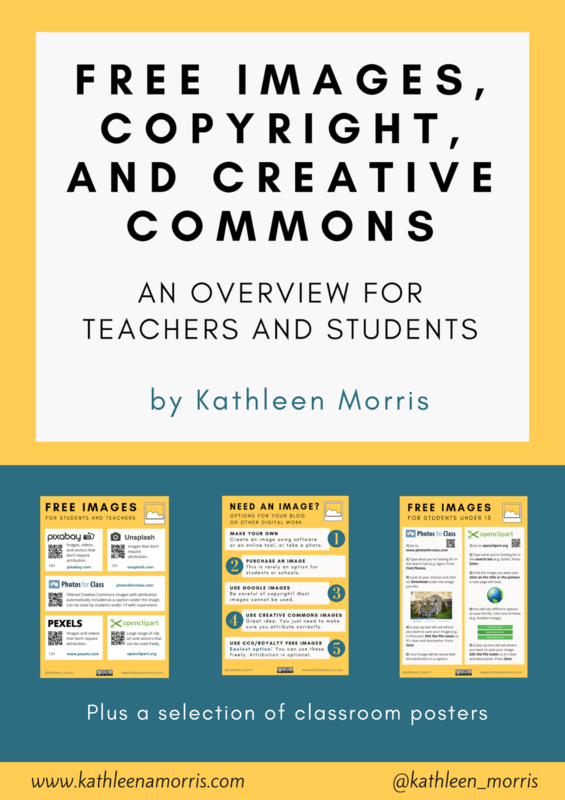 When a class completes one of the activities, they will post about it on the blog in a new post so other classes can connect, collaborate, and comment. All four teachers are administrators of the blog. Students and families will be encouraged to read and comment on the blog. Some of the classes have their own class blog, however, our team/quad blog serves as a central meeting place for the project. Blogs are often thought of as platforms that are used for an ongoing period of time, but they don’t have to be. Why Don’t You Try Team Blogging? Setting up a collaborative project isn’t as scary as it sounds! 1) Choose a day, project, or theme that you want to base your collaboration on. For example, you might like your collaboration to focus on The Global Read Aloud, Roald Dahl Day, The World’s Largest Lesson, or World Day of Bullying Prevention. It can really be based on anything and certainly doesn’t have to involve a special day. Tip: Days of the Year is a handy website to find out what ‘special days’ are coming up. 2) Consider who you’d like to collaborate with … and ask them! Twitter is an excellent place to find connections. And if you don’t know many members of the global education community, you can always put out a tweet or ask someone to help you find connections. I’ve always found it beneficial to consider if the match will work in terms of student age, expectations, reliability, availability etc. You can get a free blog at edublogs.org or use your preferred blogging platform. Someone will need to take charge and set up the site then add the other teachers as administrators. What activities will you complete and when? You might like to brainstorm through a group email (or other tool — Voxer, Google Hangouts, WhatsApp etc). It can then be helpful to write down timelines and information in a Google Doc or similar. Once the planning has come together, have fun getting started. Remember to keep communicating along the way to get the most out of your team blogging experience. Are you celebrating International Dot Day? Do you have any tips, questions, or advice about team blogging? Please leave a comment!